If you're looking for easy-to-use collaboration tools for your Communications company, then you've come to the right place. 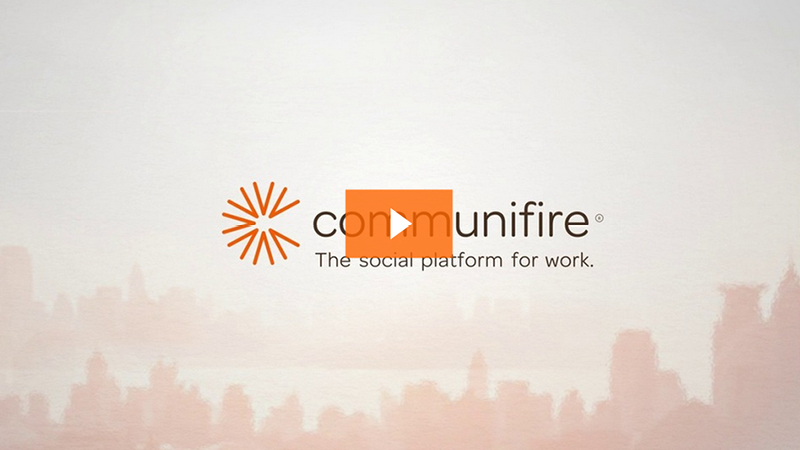 Communifire is an integrated set of tools that you can use to connect your people, organize your work, and get things done. Your employees may be worldwide, but you get work done in Communifire. Collaborate effectively and manage your projects, speeding up approvals and sharing large files quickly and easily. Make knowledge sharing fun again through Communifire's powerful collaboration tools that make the business of creative communications easier than ever. Come together as small or large groups with Communifire's online workspaces. Form groups and add members as you need. Invite colleagues, partners, vendors and consultants to collaborate on projects and share insight. Communifire offers secure, robust, flexible collaborative online workspaces so you can get to work right away. You can share information through private messages, forum posts and content you create and post. Share documents that are too large for email. Skip the hassles of logging into multiple applications. Instead, manage all your business activity through Communifire. Encourage better decision making as your communications experts and specialists have access to the relevant information they need in real time. Grow your online workspaces into highly innovative, productive hubs where members feel free to share opinion, insight and new ideas. Skip the onslaught of emails and log in to your Communifire account, gaining immediate access to your Activity Stream, a personalized feed of the news and updates relevant to you. Keep your team informed and engaged. Add your feedback with the "like" button and commenting features similar to Facebook. Share and gain insight. Project management requires assigning and managing tasks. Communifire's Task Management tools are easy to use and effective. Quickly assign tasks to yourself and your team. Add project phases and due dates. Log in to see what's been done and what remains to be done. Get a quick overview of progress on any project anytime. Streamline your work with clients. Create personal and shared calendars to stay organized and on top of important events and meetings. Organize your workweek. Add events, reminders and meetings. Share events and meetings with your communication experts, writers, visual specialists and your partners. Share entire calendars if you want. Plan out your week, month and year ahead. Create content and share your insight through Wiki Pages. Modern businesses today leverage Wiki Pages to share information both internally and with the public. With Communifire's Wiki Page tool, you can quickly create content you want to share and add files, images and videos as you need. Organize your Wiki Pages by tags so they remain in context with your existing knowledge base. Share your pages with groups, online workspaces, your company or the public as you wish. Blogging is by far one of the most effective ways to reach your ideal audience online for communication companies. However, it is often underutilized. Communifire makes it easy for you to create content and post blogs equipped with images, videos and links for greater engagement. Communifire's platform is easy to use and powerful with built-in functionality to amplify your reach. When you've got Communifire, you can focus on creating your best content. We'll do the rest. Communifire's team collaboration software provides a secure document management system that you can access from anywhere anytime. Simplify knowledge sharing and streamline communications. Speed up approvals when you offer access to a constantly updated, centralized knowledge base. Review various versions of documents via Version Control. Prior to download, you can preview documents and locate files you are looking for. Share feedback with the "like" button or comment directly on documents similar to microblogging. Avoid the hassles of dealing with document sharing via email and multiple applications. Keep your document sharing simple and effective with Communifire. Whether you just purchased a significant media share or you are knee deep in a large client project, staying on top of all the details can make all the difference in your company's success and in your day-to-day project management. Communifire's Tracking feature makes it easy for you to track anything important, whether it is a client question or concern or software issue that needs to be addressed. Respond in a timely manner and ensure you offer consistent, high quality customer service. You've got a terrific video that shares insight quickly. Share it on Communifire easily, informing and engaging your communications team. Adding video from YouTube or Vimeo is particularly easy. Upload videos right from your computer as well and organize them by tags. Add videos into your blogs, documents, Wiki Pages and ongoing discussions. Whether you've got a corporate training event or a Vine you just created, Communifire makes it easy to upload and share pronto. You've already got a whole suite of applications you know and love. With Communifire, you can easily pool in all the information you have from these apps in real time. Connect and log in, adding data into Communifire, which becomes your centralized hub for all your knowledge management needs. Access popular features like Active Directory and Single Sign-on. Send out live updates to your Activity Stream and through the Notifications feature in real time. Amplify the reach of your existing content with Communifire's social features. Keep everyone informed and engaged through a centralized knowledge base that is updated in real time. Make information sharing easy and effective. Get work done. Enjoy the convenience of working from anywhere from any device. Communifire keeps you connected with your global workforce 24/7. Remove the information barriers imposed by sharing information via email. Keep everyone engaged and connected. Streamline communications and raise productivity. With a centralized knowledge base, you can easily find all the information on any topic. Get informed and keep your team updated. Make it easy to collaborate on any project through Communifire's online workspaces. Scale up or down as you need, when you need. Keep your information organized by media files, projects, subjects and online workspaces. Make it easy for your communications teams to find what they need. Share ideas, insight and experiences through conversations within context. Help your team make better decisions armed with not only data, but team insight and knowledge. Build loyalty among your communications workforce through encouraging their active participation. They in turn will be more productive and improve customer service, leading to higher client retention.